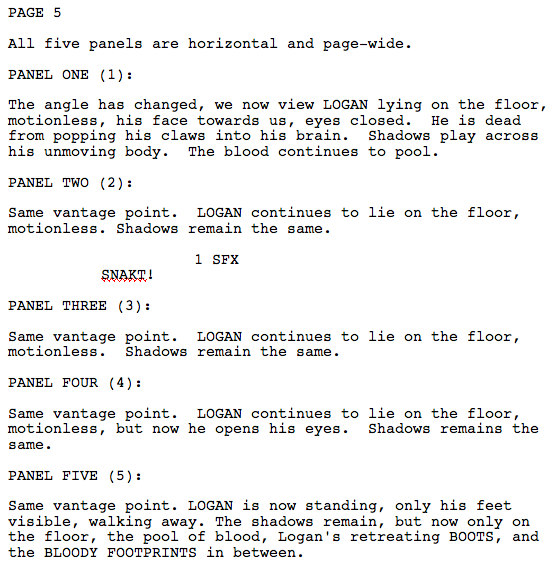 Aside from running a Wolverine chronology site, I’ve dabbled in some Wolverine script writing. And it’s not just a passing fancy. I hope one day to see it published as a Marvel comic. Not that I know anyone at Marvel, but I have written a book (‘Vito, the Cat Who Wouldn’t Purr’) and won awards for my screenplay writing (“The P.O.B. Conspiracy” short was a finalist at the DC Independent Film Festival and won a Silver Telly Award, and “Death & Reproduction” was the Grand Jury Award for Best Narrative Film at the 72 Film Fest), so I do hope it is more than just a pipe dream. ‘Wolverine: Guilt’ is another Wolverine script I’ve written (see ‘Wolverine: Shattered Memories’ for the other), a proposed one-shot that serves as a prologue to the ‘Wolverine: Origins”. When Logan recovered all of his memories during ‘House of M’, he not only remembered what was done to him, but he also learned of the unforgivable atrocities he committed over the years and perhaps most importantly, that he forgotten his beloved wife Itsu. This is a tale of the intense guilt Logan experiences over the crimes against humanity he never knew he committed and the long-forgotten wife he failed to love and cherish forever. Think of this as ‘Wolverine: Origins’ #0. I loved it. You really write Logan as a real person, your love of the character comes out in spades and I hate to keep repeating myself but really top notch work. “After reading the script for ‘Wolverine: Guilt’, I felt like I was reunited with the comic book character I idolized when I was a child. DiG shows a deep understanding of the true essence and spirit of Wolverine’s character that is buried underneath all the adamantium action and berserker rage. ‘Wolverine: Guilt’ does a phenomenal job of taking the core of what makes Wolverine a hero and brings it to the surface for everyone to see. Whether it is the amusing dialogue between teammates or the intimate exchange from two lovers, ‘Wolverine: Guilt’ nails each and every panel wonderfully. This one is definitely a keeper for both the long time fans and new readers alike. Powerfully written and expertly crafted. This is what all Wolverine stories should be. The grasp of the characters is masterful, and the images leap off of the page and into your mind (Oliver Coipel does the art inside my head for this, just so you have an idea of what I see). The idea of Logan having to deal with the memories he so recently regained is one that hasn’t been explored all that well, but you’ve done it wonderfully. From the moment he realizes that suicide isn’t an option to the silent smirks exchanged between he and Scott… your scenes are character driven, well past the speed limit, if such a thing as a character speed limit exists. I’m running out of ways to say “Wow, this was amazing.”, so I suppose I’ll just have to leave it with that. Wow. ‘Wolverine: Guilt’ is a truly gripping and introspective look into Logan dealing with the horrible realization of what he’d done and what he’d lost. This is heart-rending and violent and beautiful and grim… and so effective in establishing Logan and Itsu’s previously flimsy relationship. Reading your script, the mind’s eye quickly takes over aided by your extremely visual style of writing. Excellent handling of dialog and silences. Shocking memories of atrocities flood Logan driving him in his extreme grief to a desperately quiet suicide attempt, a scene of terrible simplicity. A beautiful segue into his memory of Itsu, with the dripping rain on his window at the mansion becoming the rain of memory in Jasmine Falls. A beautiful exchange and a glimpse of their tender love. Scott’s precise handwriting on the note and him watching Logan fly the Blackbird away – beautifully described and set up. Logan’s vigil at Itsu’s grave/shrine is very reminiscent of the many times we’ve seen him at Mariko’s tomb – a beautiful scene. Sadly and unfortunately, for Logan the road he most often travels is one of death and pain…and guilt. DiG, this is fantastic. For obvious reasons, I am apprehensive about publishing the full script online, but if you are interested in reading what I wrote and would be willing to provide a review for this page, drop me a line at dig@typingmonkeys.com. 4 Comments on "‘Wolverine: Guilt’"
DiG, yes, this is truly fantastic, and I hope that Marvel will soon take note of your work. This is my favorite of the two stories that DiG has written. I would gladly pay money to see this story illustrated. We need to make this happen! Where do I sign? I want this book to reach Marvel! I am willing to give my support! Win and a half! I’m totally in for this thing making it to the House of Ideas. Whatever it takes, boss. I’m in. I got your email DiG! I am willing to give my support and read whatever you want!